American Girl® Brings The Nifty '50s To Life With New BeForever Character Maryellen Larkin! | Mattel Inc.
American Girl® Brings The Nifty '50s To Life With New BeForever Character Maryellen Larkin! 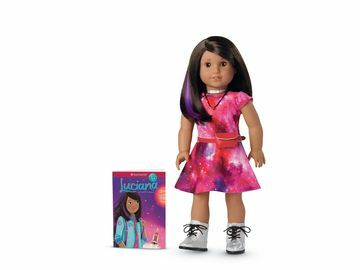 MIDDLETON, Wis. -- Today, girls will be transported back to the fabulous 1950s when they meet American Girl's newest BeForever™ character—Maryellen Larkin—an energetic and optimistic girl who follows her heart instead of the crowd. Depicting an era that gave rise to tremendous growth and change in America, Maryellen's products and stories have an intergenerational appeal that is sure to be a hit with girls, moms, and grandmas! The Maryellen collection includes an 18-inch doll with strawberry-blonde hair and hazel eyes, plus several historically-authentic 1950s doll outfits, like an iconic poodle skirt and saddle shoes. Numerous accessories round out the play experience, including a 30-piece diner set, a TV console that works with a girl's iPad, and a jukebox that plays '50s-style songs and connects to electronic music players. Written by award-winning American Girl author Valerie Tripp, the Maryellen stories introduce readers ages 8 and up to a key cultural theme of the 1950s: conformity versus individuality. While Maryellen feels the pressure to conform to social standards, she also strives to stand out and be true to herself, even when that means going against expectations. Through Maryellen, Tripp shows how trends of the 1950s—such as the burgeoning of suburbia, "the baby boom," geographic and economic mobility, new technology (like TV and rockets), rock 'n' roll, and lingering postwar prejudice—shape the life of one girl. "At first glance, Maryellen's circumstances appear determinedly normal," says American Girl author Valerie Tripp. "I did this deliberately, so that I could show that the extraordinary exists with the extra-ordinary, and it is Maryellen's own sparky pizzazz that makes the difference." 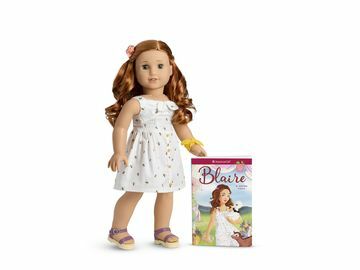 To celebrate Maryellen's debut, American Girl retail stores will be bustling with Maryellen excitement with free and paid events, including giveaways, crafts, and in-store activities. And at americangirl.com/scrapbook, girls can explore the era with Maryellen's Nifty '50s Scrapbook. The online digital scrapbook—told from Maryellen's point of view—will include photos, illustrations, video clips, games, and activities. For parents and teachers, a free downloadable Maryellen Learning Guide, available at americangirl.com, explores themes and issues from the 1950s. The Maryellen doll and related products will be available August 27, 2015 at americangirl.com; at all American Girl retail locations nationwide; through American Girl's catalogue; at American Girl specialty boutiques at select Indigo™ and Chapters™ locations in Canada; and at El Palacio de Hierro in Mexico City. The Maryellen books can also be purchased through retail and online booksellers. To learn more about Maryellen and the BeForever line of historical characters, go to americangirl.com or visit American Girl's social channels. To request a free American Girl catalogue, call 1-800-845-0005. American Girl is a premium brand for girls and a wholly owned subsidiary of Mattel, Inc. (NASDAQ: MAT) (www.mattel.com). The Mattel family of companies is the worldwide leader in the design, manufacture, and marketing of toys and family products. Since its inception in 1986, American Girl has been devoted to celebrating girls ages 3 to 12 through high-quality dolls and accessories, books, clothes, movies, and unforgettable experiences. Best-selling lines include BeForever™, Truly Me™, Girl of the Year™, and Bitty Baby™. Headquartered in Middleton, WI, the company sells products exclusively through its award-winning catalogue, on americangirl.com, and in its experiential retail stores. By inspiring girls to be their best, American Girl has earned the loyalty of millions of girls and the praise and trust of parents and educators. 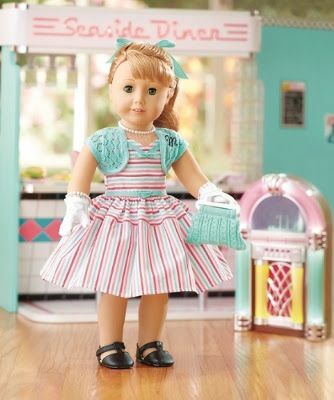 American Girl's new BeForever doll, Maryellen Larkin.